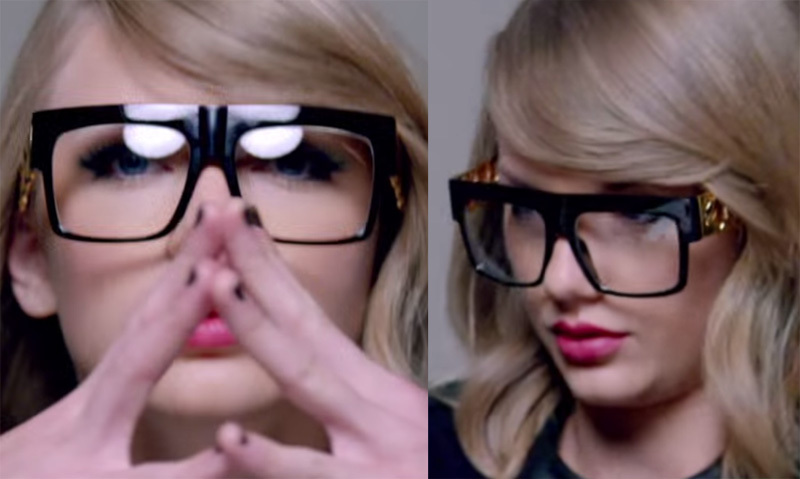 Taylor Swift wears a pair of black glasses with 'gold chain' temples in the music video Shake It Off. The frames worn by Taylor have clear lenses. The brand Céline makes a similar Gold Chain sunglasses, but we don't know if Taylor wears the Celine Gold Chain glasses or a cheap replica of this model. You can find the same model for $10 on Amazon or eBay. This pair on Amazon with clear lenses looks very similar to the ones worn by Taylor Swift. You can also find gold chain models with dark sunglass lenses.